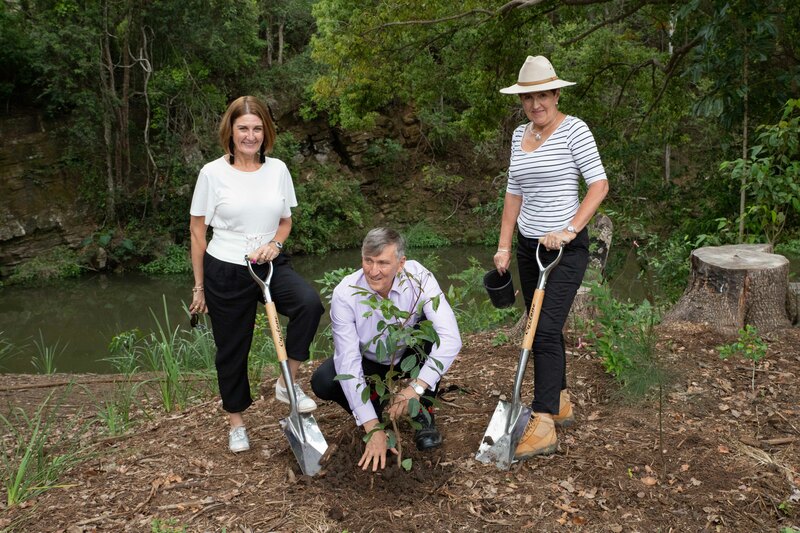 Scenic Rim Regional Council Mayor Greg Christensen has planted the 15,000th tree in a project that has helped to improve the water quality of local catchments, reduce erosion and encourage the return of native plants and animals. Council began working with the Federal Government’s Green Army in 2015 to remove tonnes of invasive weeds including privet, celtis, madeira vine and the castor oil plant from the 6.5-hectare site at Riverbend Drive, Canungra, and revegetate the area with native plants. It has continued to gain ground in the war on weeds, working in partnership with participants in the State Government’s Skilling Queenslanders for Work program. With the release of the 2018 Healthy Land and Water Report Card this month, Cr Christensen said the Canungra project highlighted Council’s efforts to improve the wellbeing of Scenic Rim waterways across the region. “This site alone has seen substantial works including weed treatment and revegetation to reduce the proliferation of weeds by targeting their removal and replanting the area with native species,” he said. 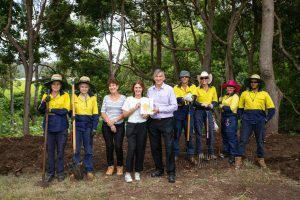 The 15,000th tree was planted earlier this week at a site along Canungra Creek as part of Scenic Rim Regional Council’s ongoing restoration project. Part of the project has involved the selective removal or trimming of pest camphor laurel trees, which are an introduced species, to allow the re-establishment of native plants. The camphor laurels will eventually be removed when the native plantings are established and able to retain the creek bank. “This project has also improved the amenity of the area as we are retaining access tracks which allow members of the community to make the most of this green space,” Cr Christensen said. 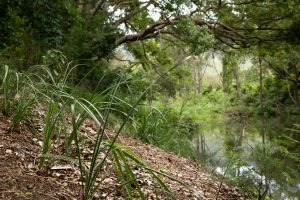 In reserves and parks along Canungra Creek, Council has also been waging war against the invasive cat’s claw vine, which contributes to local flooding and the erosion of stream banks, to support the Cat’s Claw Project being delivered by Healthy Land and Water. Healthy Land and Water CEO Julie McLellan congratulated Scenic Rim Regional Council for helping to fight off environmental pressures faced by Canungra Creek and the region’s catchments. “As the 2018 Healthy Land and Water Report Card results outline, Scenic Rim Regional Council’s efforts in driving rehabilitation work such as the Canungra project is helping to maintain the environmental health of the catchment,” she said. “By continuing to work together and protect streambank vegetation from clearing and weed infestation, we can strive to improve catchment condition which we know can have a positive impact on recreational value for both local residents and visitors alike,” she said. 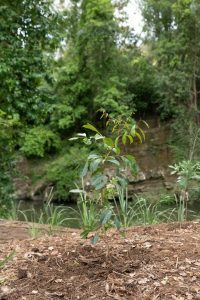 Council’s ongoing investment in the health of waterways across the Scenic Rim is supported by the One Million Trees Program, in which 300,000 trees have been planted since 2014, and the River Trees initiative, which supports the efforts of property owners whose land borders riparian areas, by providing carefully selected native plants for revegetation projects. Through the Council of Mayors South East Queensland, Scenic Rim is also a key stakeholder in the Resilient Rivers Initiative to improve the health of catchments including the Bremer River. “These projects complement the ongoing partnership of Councils and landowners via the Scenic Rim River Improvement Trust, to preserve our waterways and prevent valuable agricultural soil being swept downstream, affecting Moreton Bay,” Cr Christensen said. Scenic Rim Regional Council (SRRC) Cr Virginia West, Healthy Land and Water CEO Julie McLellan and SRRC Mayor Greg Christensen with participants from the State Government’s Skilling Queenslanders for Work program.